Design for an embroidered chair back by Robert Anning Bell. Home » Design for an embroidered chair back by Robert Anning Bell. Embroidered chair back by Robert Anning Bell, R.W.S. Embroidered chair back by Robert Anning Bell. Victorian painter Robert Anning Bell 1863–1933 was an English artist, figure painter, sculptor of reliefs, illustrator and designer of mosaics and stained glass most notably for Westminster Cathedral. 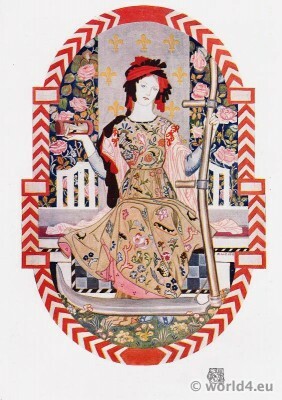 This entry was posted in 10s, 20th Century, Art Nouveau, Embroidery, England and tagged Artist, Embroidery designs, Furniture on 9/1/14 by world4.